CTrail's new Hartford Line, which will carry passengers between New Haven and Springfield, will begin service on June 16. In its heyday, the Hartford rail line offered passenger travel at its finest. Each hour, it brought New Yorkers to Springfield and on to Boston—or through Vermont all the way up to Montreal. And through the 1940s they often traveled in a Pullman car. 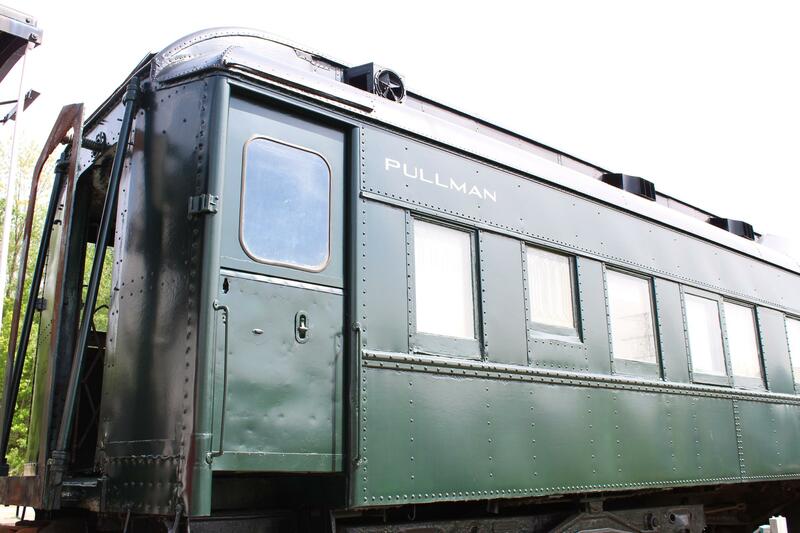 An antique Pullman car on the grounds of the New England Railroad Museum in Thomaston, Connecticut. Howard Pincus, a trustee of the Railroad Museum of New England, showed me inside the steel Pullman car, painted forest green. We walk past a drawing room and sit across from each other on pale green seats. The car features air conditioning and full service dining. 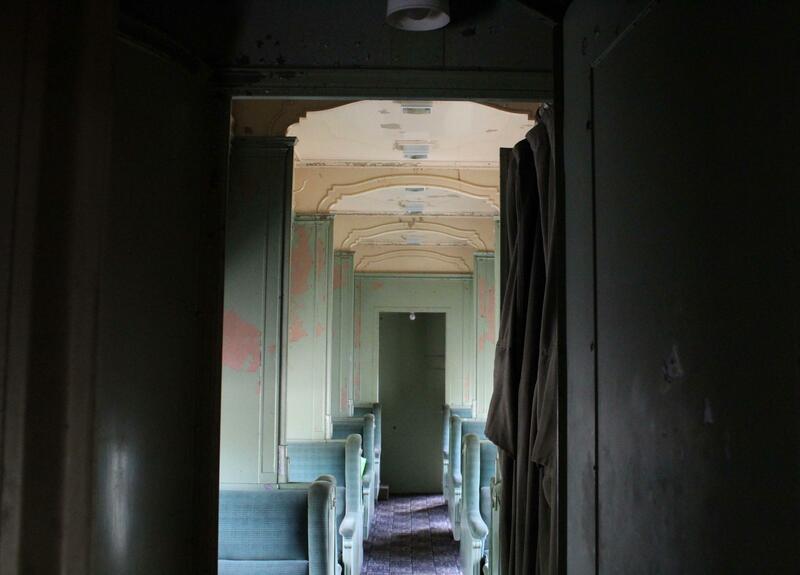 A view inside the Pullman car, from the drawing room to a passenger seating area. 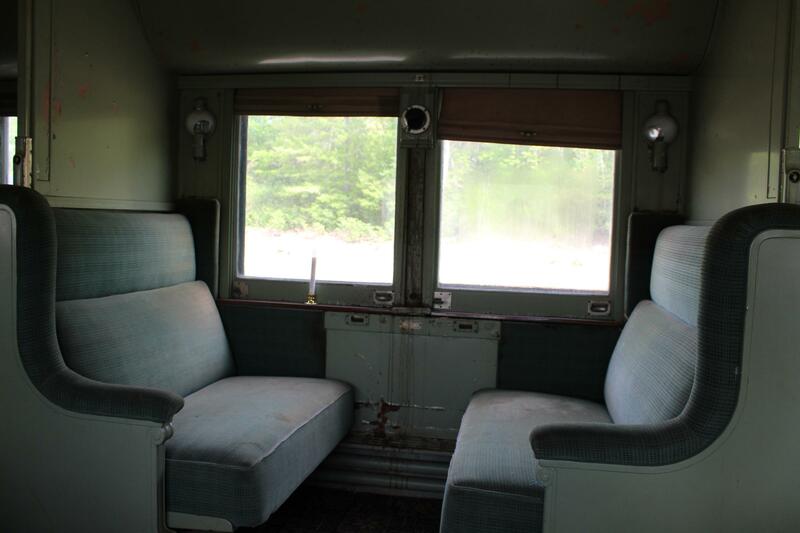 The original pale green seats and picture windows in the vintage Pullman. Pincus says that didn’t last. After World War II highways and airports expanded. Declining industry no longer wanted to ship cargo on freight trains, so private railroads couldn’t make enough money to keep passenger service going. “It was an incredible double whammy,” he said. Pincus pulls out two books of train schedules and measures them spine to spine. “This is June of 1941 and this one is August of 1964—what that represents, those missing pages, those are goooone passenger trains,” Pincus said. 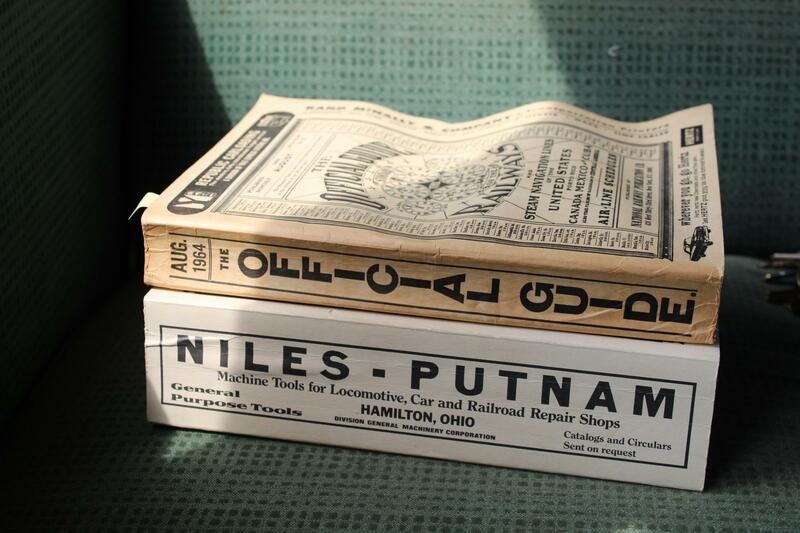 Vintage railroad books cataloged train schedules across America from the 1940s through the mid-'60s. Just as rail service was going under in the ‘70s, the federal government created the passenger railroad company we know today, Amtrak. Connecticut's Department of Transportation Commissioner Jim Redeker says even with federal help, money was tight. “Amtrak, uh frankly, has been uh, strapped for cash probably through its whole existence,” he said. Redeker says in the 1980s the two tracks along the Hartford line cost too much to maintain. 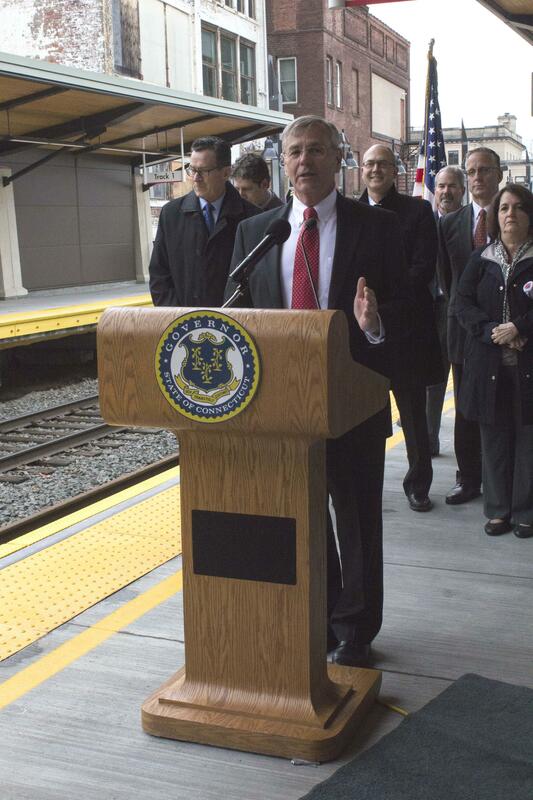 Connecticut Department of Transportation Commissioner James Redker speaks at a ribbon cutting for the Hartford Line at the Meriden station in May. That is, until now. After 30 years, Connecticut raised more than $700 million in federal and state funds to build new stations and bring back that second track. “Seeing a track-laying machine come through Connecticut and put a mile of brand new railroad down in a day was really an amazing achievement and something that is a once in a lifetime opportunity,” Redeker said. But that took time. Redeker says workers essentially had to build a new railway, new bridges and new stations—that meant a six-month delay for the opening. Still, Redeker sees this as a boost for the region. Redeker says even before service started, towns along the route have seen nearly $400 million in investment—new buildings popping up around the tracks. One of those cities is Meriden, Connecticut. As an Amtrak train rolls into the station, Caleb Edwards waits on the platform. Edward says he’s excited that his hometown is part of the Hartford Line revival. 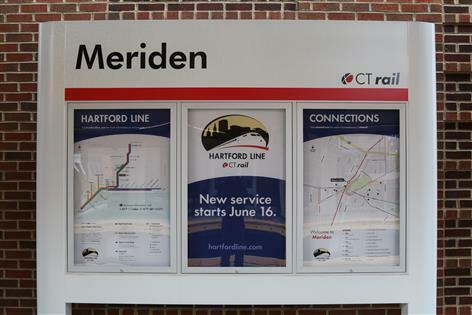 Information on Hartford Line service at the new Meriden station. Edwards wants to go to New York City, and he usually has to catch an Amtrak train to New Haven and transfer. The Hartford Line means trains run twice as often at half the price. And, Edwards says he doesn’t need the stress of traveling through traffic on New England’s highways. And he’s not alone. On the Massachusetts Turnpike, Eric Lesser takes a call on his drive to the capitol in Boston. Lesser is state senator in the district that includes Springfield. He sees the Springfield to Hartford connection as the first step toward a high speed rail track that would connect Hartford to Boston via Springfield.  “If you link the two regions by rail service, the metro Boston area gets access to a lower cost of living, more affordable housing, and the Springfield-Hartford region gets access to those high paying jobs,” Lesser said. After three years, Governor Charlie Baker has finally pledged to fund a study looking at that plan. For now, Lesser says Massachusetts’ priority is to extend the Hartford line north through college towns like Northampton, up to Vermont. Critics worry that the Hartford Line doesn’t really transform rail travel in New England, that the “high speed” trains only reach 110 miles an hour in a few spots, and that there’s not enough federal funding to expand service. 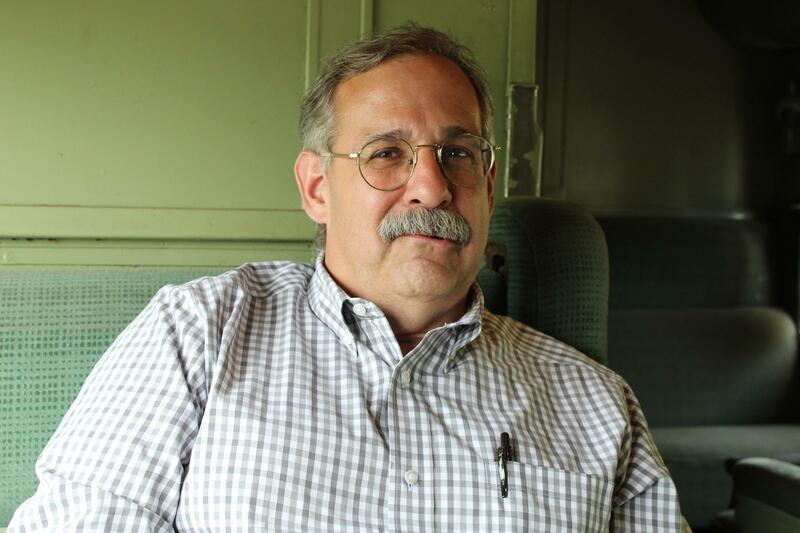 Back on the antique Pullman sleeper car, Howard Pincus says he still thinks politicians have learned a valuable lesson that made them reinvest in the Hartford Line. Rail Museum of New England Trustee Howard Pincus back on the Pullman. Pincus says without public transportation, nobody will be able to go any place on crowded highways between New York and Boston.